One of the bedrock foundations of a totalitarian state is when the individual loses the right of self-determination. Without question, the most basic right of any human being is the right to determine what one puts into ones own body and what goes into the body of their child. New York has over time, become one of the most authoritarian states in the world and just recently mayor Bloomberg has done his part to completely secede New York City from EVERYTHING this republic ONCE stood for. Like so many despots before him, NYC mayor Bloomberg believes he alone (acting as the judge, jury and executioner of the state) can determine what is best for you and your children. However, even the mass killer communists and national socialists didn’t go as far as Bloomberg by telling the people of NYC what they MUST put into their OWN veins. New York state has degenerated so far down into the cesspit that these New York pimp-daddy bureaucrats for their big pharma masters have taken away the individual right to reject vaccines based on SOUND logic such as avoiding all the heavy metals, stealth and cancer viruses that are well documented to be in vaccines. The inserts in many of the vaccines clearly states in black and white ‘MAY CAUSE DEATH!’. The state of New York has taken away the ‘right’ to ‘object to vaccination for sound ‘conscientious’ reasoning. i.e. may cause death and, have on purpose, made vaccine exemption a ‘religious’ objection debate. They are such despots in New York that even religious objections have become nothing more than inquisitions by the state, plain and simple. SEE VIDEOS BELOW (This is an out right inquisition by the state of New York nothing more nothing less.) This is NOT American. This Bloomberg issuing laws that usurp the US constitution is NOT about vaccines. It’s a self determination issue. plain and simple. Protest Planned Against Last-Minute Bloomberg Push for Mandatory Flu Vaccines. Autism advocates are set to protest tomorrow against a quiet effort by Mayor Michael Bloomberg’s administration to require annual flu vaccinations for all New York City schoolchildren under 5 years of age. The Board’s members are all mayoral appointees and controversial initiatives–from smoking bans to regulations on soda cup sizes–have historically sailed through with little opposition, angering a small, but vocal group of advocates who claim the vaccinations are potentially dangerous. “The Bloomberg administration is wildly exaggerating the benefit of the flu shot and we think they are wildly underestimating the risks involved with it,” said John Gilmore, the executive director of the Autism Action Network, speaking more broadly than the controversial claim that links vaccines to autism. “There are risks associated with every medical procedure,” he said, citing allergic reactions, toxic mercury used as a preservative and questions as to whether the Board’s move is legal given state government jurisdictions. Mr. Gilmore’s organization is helping organize tomorrow’s protest. And though he doesn’t expect the Board’s vote to go his way, he hopes the rally will get Mayor-elect Bill de Blasio’s attention, potentially opening the door for a reversal once he takes office in January. According to a Board of Health notice made public in September, influenza results in 20,000 hospitalizations and 30 to 150 deaths in children under 5 nation-wide each year. Katie Couric Gets Attacked For Doing Her Job. One thing the pharmacological Industrial Complex does NOT like, is when one of THEIR paid for media reps goes rouge and spills the beans on just how dangerous vaccines are. This attack on a journalist doing her job should make people pause and think for one moment and, ask themselves this one question. Why would Katie Couric get attacked so hard for exposing Gardasil facts where, had this simply been yet another drug gone bad, there would have been very little backlash, even by the very drug companies that virtually own all the major news media? I personally get many, many teen girls and mothers of teen girls with personal horror stories reaching out to me through this blog, after taking this pure garbage into the veins. This is NOT an isolated case and it’s criminal that, we as a society, even tolerate for one second this nonsense. If HPV vaccines were consumer goods would they still be on the market? Now, I wrote this very same article and asked the very same question back in 2009. This is a great article that not only exposes the mental illness in our society, that is, to be conned into injecting lethal garbage into our young girls NOW `boy’s veins but, it also clearly demonstrates that we live in a society where the welfare and common good of the PEOPLE are trumped by corporate interests. This article is a textbook definition of a fascist society. by Stephen TunleyThe latest statistics from the USA’s Vaccine Adverse Events Reporting System (VAERS) statistics concerning the serious side effects and deaths associated with HPV vaccines such as Gardasil make for chilling reading. More than 6,000 who did not recover from the new medical conditions experienced after HPV vaccines. The picture is not pretty and were you to add a zero or two to these numbers to account for under-reporting, the picture is frightening indeed. It’s important to note that the statistics are for events occurring primarily in the USA; not taking into account other countries, which have faced very similar health issues. In the case of Gardasil for some reason the same safety issues that govern say; automobiles, baby equipment, tires, peanut butter and more do not apply. Vaccines appear to be subject to very different standards, standards where it is quite acceptable to have deaths, life threatening and life changing illness associated with your product. Standards where reports made to anyone from the manufacturer, to the regulator(s), to the so-called experts result in scant investigations by those who have worryingly close ties to the industry which they are supposed to be investigating. whether the Japanese-based automaker had needlessly put the public at risk.What committee is reviewing the considerable health issues that surround HPV vaccines? To date, the answer is none. If Gardasil were a baby sling, it would have been pulled from the market after just 3 deaths as was the case with the Infantino baby sling – one million were recalled in March, 2010. More than 400,000 drop-side cribs made by Simplicity in the USA were recalled in July 2009 after an 8-month-old child in Houston suffocated.Yet many tens of thousands of serious adverse reactions and over 148 deaths temporally associated with Gardasil do not appear to issue a single raised eyebrow amongst those charged with overseeing safety, by this I mean in the USA the FDA, in Europe the EMA, and the TGA in Australia! In 1982 Tylenol recalled 31 million bottles of the product after 7 Deaths. I resisted putting ‘just’ before 7 but it sure puts the issues to do with Gardasil into perspective! So why is Gardasil treated differently? The fact is it should not be. It’s a product just like Tylenol or Toyota. Consumers pay for it (directly or via tax imposts) and it should be governed by the same rules as any other product i.e. it should be a product fit for use and if it’s not then it should be recalled immediately. I cannot imagine any person of sound mind going ahead and purchasing a baby sling from Infantino if they knew it had caused, or could cause, a single death, yet they will merrily march their daughters, and now sons, to the local medical center and have them vaccinated with a vaccine that has demonstrated considerable and very serious health issues associated with it?But it gets worse. Gardasil has not only far too many deaths and serious health issues associated with it, there is no proof that it works! HPV vaccines have not been proven to prevent even one case of cervical cancer. HPV infections are only one of several risk factors contributing to the development of cervical cancer. When detected, HPV infections are easily managed and rarely proceed to cervical cancer. At least 50% of sexually active men and women are exposed to HPV at some point in their lives. 90% of these infections clear on their own within two years without incident. Those exposed to vaccine relevant HPV types may experience an increased risk of precancerous lesions if vaccinated. HPV vaccines would have to be effective for at least 15 years to prove effective at preventing cervical cancer. Yet, HPV vaccine efficacy begins to wane at 5 years! Symptoms experienced after HPV vaccinations are lasting longer than 5 years in some girls. Pap screening has already been proven to be a safe and effective means of controlling cervical cancer. It’s also very inexpensive and causes no significant health issues. No one has died from a PAP smear. Recombinant HPV DNA L1 gene DNA fragments possibly attached to the aluminum adjuvant, were discovered in 100% of samples tested Gardasil in 2011. To date there has been no serious investigation as to potential health impacts. The FDA simply declared the ‘expected’ presence of residual DNA is not a safety factor. No documentation was provided in support of this. The fact HPV vaccines were approved by Governments worldwide based on manufacturers’ assertions that the vaccines contained ‘no viral DNA’ was ignored completely  ,  The possibility of recombinant HPV DNA fragments being attached to aluminum adjuvant particles was also ignored. It was discovered that the naked HPV 16 L1 gene fragments bound to aluminum particles by ligand exchange in Gardasil-have acquired a non-B conformation. This conformational change may have stabilized the HPV 16 gene fragments in Gardasil preventing their normal enzymatic degradation in vaccine recipients. ,  Non-B DNA conformations and their relationship to diseases has been studied since the 1960′s. Based on current scientific knowledge, the human genetic consequences of these non-B DNA structures are approximately 20 neurological diseases, Approximately 50 genomic disorders and several psychiatric diseases. ,  The impact of injected foreign non-B DNA on human health is totally unknown. 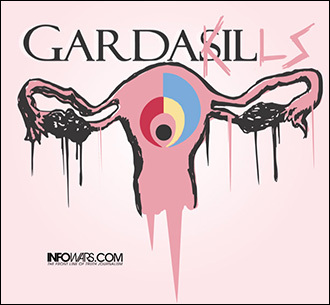 Now for the good news, the manufacturer of Gardasil, Merck have sold hundreds of millions of vials of Gardasil resulting in billions of dollars of revenue from the product worldwide and now are working on a vaccine for…. Yep – you guessed it – Chlamydia! So the company that is plausibly linked to a product that has (for some reason as yet unknown) has led to a rise in pretty serious STD, will at some stage launch a vaccine to fight it. Now that’s an integrated marketing strategy if ever I saw one. But wait there’s more … sadly a lot more. In the USA the regulator that oversees products like Gardasil – the FDA -is largely funded by virtue of the fees it charges Pharma and others to approve the product it regulates. This is the same position in Australia, where the TGA is along similar lines Funded. In the USA the senior agency to the FDA is the NIH All which is in fact a share holder in the patent behind Gardasil and benefits from its success via the receipt of increasing patent income. One more thing and it’s a big one. If your baby or automobile product is defective and proved it led to a single death, the manufacturer can be taken to court, sued and if the case proven, liable for considerable damages. This is not the case with vaccines where the ability to sue the manufacturer was removed by the creation of the Vaccine Injury Compensation Program in 1988. This leaves those damaged by vaccines to apply for compensation under VICP, which is funded by a tax on each vaccine administered. Now, the powers that be add insult to injury. If the injury experienced after a vaccine is not listed on the very limited table of injuries and occur within the time frame listed, it is up to the consumer to find experts who can prove their injury was caused or exacerbated by the vaccine. When it comes to HPV vaccines, the consumer is on their own because there are NO injuries listed on the VICP injury table – these vaccines are too new to have established a track record for damages. Contrast this to a normal court case where it would be up to the manufacturer to prove their product did NOT cause the damage. Sadly, the same is true in many other countries where the ability to sue a vaccine manufacturer is limited, or has been removed by statute. HOWEVER, there is one country where government health officials appear to actually be concerned about what happens to their citizens after vaccinations. Interestingly, Japan has recently stopped recommending the continued use of HPV vaccines until a safety investigation has been completed. So there you have it. One set of rules for vaccine manufacturers and a completely different set of rules for everyone else. It’s time for this farce to stop. There is absolutely no basis that supports Gardasil is a product fit for use. It does not do what it purports to do, damages far too many that receive it, leads to some pretty horrible health effects and consequences . Yet the manufacturer stands above being sued by virtue of legislation. This product must be recalled and recalled now. A truly independent review of what happened and why needs to be conducted with the ability to amend / repeal legislation, overhaul the regulators, and ensure the disclosure of conflicts that exist between the manufacturer so called independent experts and the regulators. In the meantime, as a parent wake up, do the research before you vaccinate – or your child could be one more ignored VAERS statistic – is that the future you want for them? Stephen Tunley is the director of SaneVax, Inc. where this first appeared.